Bullied and spied his way to the Sole Survivor on Cagayan (28). Current Residence: Jersey City, N.J. Personal Claim to Fame: Becoming a Jersey City police officer. Inspiration in Life: My father for being the dad that he was. He was a great role model and I hope that I can be the same for my children. Hobbies: Jet skiing, playing pool and surfing the web. Pet Peeves: Thugs who wear skinny jeans. Also, people who see me speaking on the phone, but yet they feel the need to start a conversation with me. Like it’s that urgent for them to know "how's it going" while I'm speaking on the phone. SO RUDE!!! 3 Words to Describe You: Versatile, clever and competitive. If You Could Have 3 Things on The Island What Would They Be and Why? Cigarettes, coffee and liquor. I don’t smoke or drink coffee or liquor, but I would love to bring those items with me just so that I can barter with my tribemates! You know at some point in the game they would even give up immunity just to have a little taste of these items. 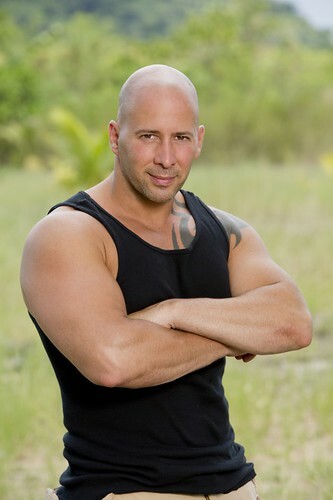 SURVIVOR Contestant You Are Most Like: Russell Hantz, because I can be just as devious. Boston Rob, because I can be just as slick. Reason for Being on SURVIVOR: My main reason: The MILLION DOLLARS of course. There's no way I would be going out there for half that prize! Secondly, I’m a huge fan of the show and I would love to give the fans a great season to be remembered. Why You Think You’ll “Survive” SURVIVOR: Adapt and overcome! That’s the kind of training I have as a cop and that’s exactly what I’m going to do on that island! Adapt and I will overcome! Why You Think You Will Be the Sole SURVIVOR: I have been a street cop for 12 years. My experiences as a cop give me a huge advantage going into this game. Being outside my element is my forte. That's what I do for a living. What’s going to be normal for me will be very stressful for the average castaway. Do You Consider Yourself a Brain, a Beauty or a Brawn? Sounds like a trick question. We'll let’s see. I'm a beautiful person that has a sharp brain and strong muscles. Based on appearance, I would consider myself "Brawn." For the purposes of Survivor though, I would consider myself "Brains." Maybe I wasn't the smartest in school, but I was always the sharpest!!! Who Do You Think Has the Best Chance in the Game of Survivor: Brains, Beauty or Brawn? Survivor is definitely a game of all-around strategy. Brawn and beauty can fight over silver, but Brains would surely bring home the gold! OH wow, I hated him so much, but he kicked their asses. Tony is someone that needs to form an allaince day one or he is screwed. No one is going to be dumb enough to let him build a spy shack again. That head is too small for his body. Yes. But without the charm. How have you changed since the last time you played? I'm older and much wiser. Just kidding. I'm older, but definitely not wiser. You will see the same guy in this season as you saw in Cagayan. What skills do you bring to Survivor that will make you a useful member of the group and what skills have you been learning since you last played? Unfortunately, the skills I bring to Survivor are skills that will NOT make me a useful member. Instead, they will make me a very threatening member. I haven't learned any new skills since I played on Cagayan, which could be my downfall going back on an all returnee season. I wish I could have learned the skill of being able to be quiet and try to play under the radar, but I don't see that happening. It’s just not in my DNA. What are you most proud of from the last time? What, if anything, do you most regret? There is seriously nothing I regret. Everything I did on Cagayan was on the fly. Some things were based off of emotion, some based off of strategy, but nothing was based off of malice. In the end, it all fell into place and I became the Sole Survivor. How will you play differently this time? Going into the game this time around, with all the players knowing my game style, I know that I'm going to be a huge threat. Having said that, I know I will have to take it down a few notches until I can plant my roots. Knowing myself, I won’t be able to take it down any notches and will be in trouble. I hope I have what it takes to adapt right away and "go with the flow"—if that’s even possible for me to do. I will have my fingers crossed for sure! While I'm pretty glad he was voted out because there was no way I wanted this fool anywhere near the million dollars, I regret the ridiculous recapping opportunities that have been missed with his ouster. That underground bunker idea was the work of a madman! My favorite part: "But behind every joke lied the truth." Well said, Nutjob. Well said. Had he kept his head, instead of going off half cocked, he could have used the info he half heard and made Sandra think Troychimp looked guilty of selling her out. But no, he just jumped to conclusions and out he went.